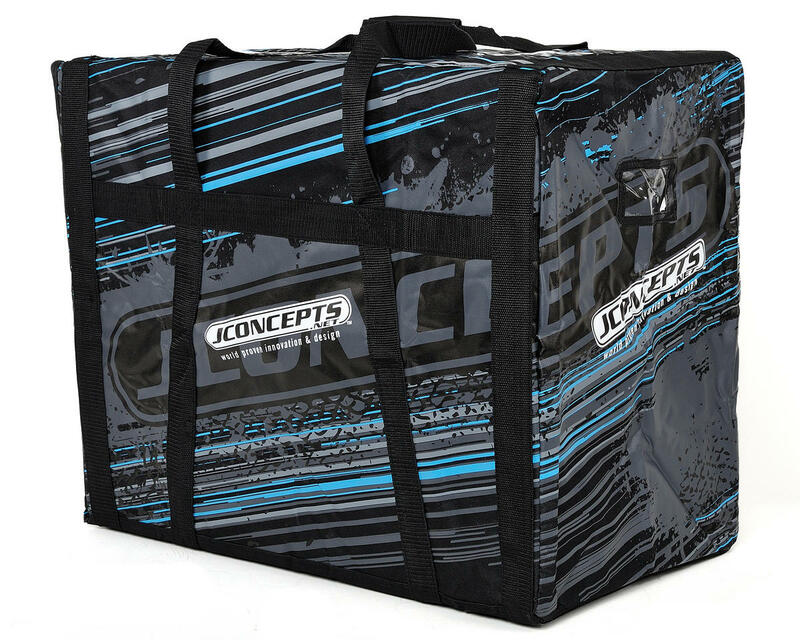 This is the JConcepts Medium Size Racing Bag. This multi-purpose equipment bag can be used for almost any of your R/C needs. Its design and dimensions allow you to store and transfer just about any combination of compact R/C equipment you desire. With a total of 3 drawers, there is enough room for different size vehicles, including; a 1/10 scale buggy, short course truck or touring car as well as room for an 1/8 scale buggy, radio gear, tools, tires, and other various gear. 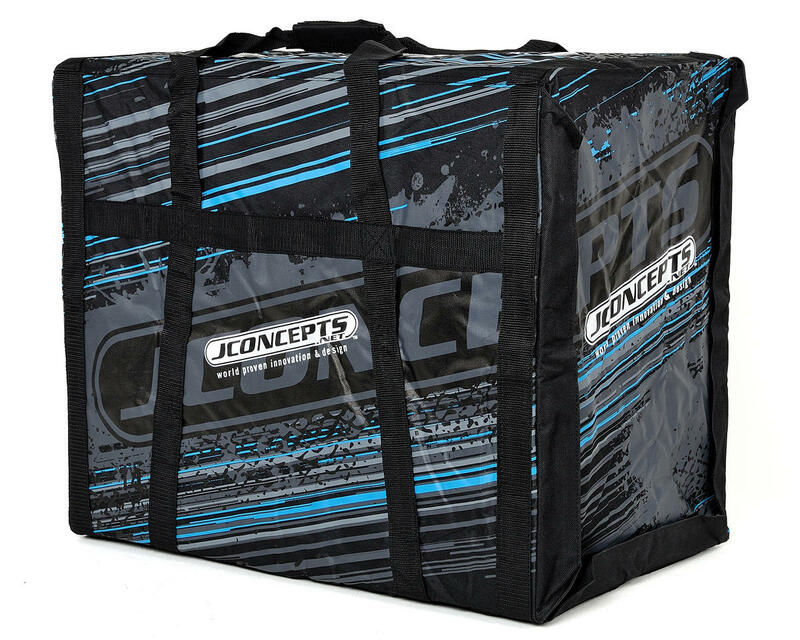 This racing bag has the JConcepts logo printed on each end as well as the sides and top with assorted graphics and imagery. The front-load hook and loop closure design combined with composite inner liner allows easy access to all the individual drawers. Additionally, three composite drawers with dividers make the inner workings of the JConcepts racing bag nothing short of spectacular for the organized racer. NOTE: When assembled, the inside boxes measure, 22.5”L x 12.5”W x 6 "H.
Picked this bag up today in an effort to get my nitros and electrics separated and organized. I've had the Ofna bag for about 2 years now and it's held up pretty good but it has to be getting close to 80lbs now. This (JConcepts) bag is a nice size for 1/10 buggy. The drawers are wide (12 3/4") and fairly long (22 1/2") but they're also pretty shallow at (6"). Assembly is simple and while the drawers are indeed made of plastic, they look just like corrugated cardboard that has been painted black. They do have a fairly nice plastic handle that attaches to one side of each drawer that is pretty handy. 1/10 scale buggies fit just fine with the body, wing, and tires installed and my 1/8 buggy actually fits with the body, tires, and wing on as well (suspension is compressed slightly to clear the wing but far from bottomed out). There is plenty of width for the 1/8 buggy in the drawer and room for some other items as well (few sets of extra tires, fuel bottle, etc). I have a feeling the durability is going to be suspect as I actually tore the stitching of the "door" panel as I was sliding the inner liner into the bag (pulling it over the plastic frame). Wife re-stitched it for me without and hopefully the rest of the stitching holds up (the material didnt tear, just the stitching) much better as I didnt tug on it very hard at all (the Ofna bag has flat out been abused and this hasnt happened). I also dont care for how door flap secures when it's closed up. The sides of the container wrap around the flap (door) so you cant just reach down and pull the door up from the bottom (you have to actually remove the sides individually); not a huge deal but a zipper with a strip of velcro at the bottom would have been much easier to access in a hurry. The only other gripe I have is that there arent any wheels or handle to make transport easier. -Each drawer is the same size and will hold 9 plastic organizers that are 11 3/8" x 7 3/8" x 1 9/16" (LxWxH); $2 at Harbor Freight. Ok bag, holds lots of stuff as long as its all light as it gets heavy fast. does not hold weight the best but fair, sc truck fits with body on but even with out wheels suspension is compressed. hard to carry when it is heavy. if it had wheels and handle is would be great. Nice bag, great for quick practice sessions or holding extra cars.